One of the highlights of dining at a red sauce Italian joint is getting an order of fried ravioli with marinara sauce. You can recreate that magic at home with this quick snack recipe. It's actually healthier, and a lot easier to make, because the ravioli are baked instead of fried. Using prepared cheese ravioli gives you a huge head start, as well. These are fun to set out for game night or as an after-school snack. Because they're homemade, they taste a lot better than those store-bought frozen snacks that you heat up in the microwave. Gluten-free? No problem. To make these fried ravioli GF, substitute 3 tablespoons gluten-free Italian-seasoned panko bread crumbs for the bread or use a slice of gluten-free bread in the food processor and use your favorite gluten-free ravioli. Add 1 tablespoon finely grated Parmesan cheese to the bread crumbs for extra flavor. Add 1/4 teaspoon (or more) garlic powder to the olive oil with Italian seasoning for a little extra flavor. Per Serving: 258 calories; 13g fat; 25.4g carbohydrates; 10g protein; 22mg cholesterol; 483mg sodium. I cheated and bought pre-made cheese ravioli. I mean that's the way to do it right when you don't have much time and want a baked snack in the middle of the night? Alongside the marinara, I had some leftover alfredo sauce that I made a few days ago and it was so delicious. I felt no guilt at all, but that is to be determined the next day. Regardless, I enjoyed these as it reminded me of the times I would call the only Italian restaurant open after midnight to order fried ravioli. 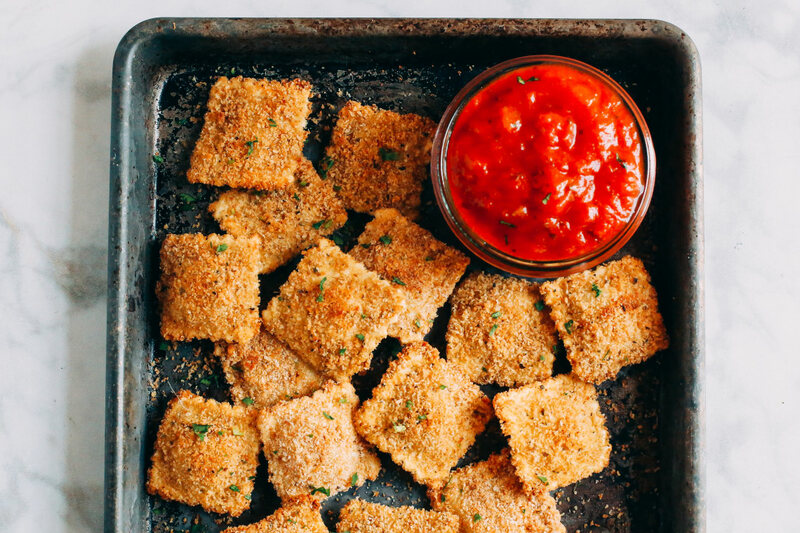 This baked ravioli is incredible! They're so good, I throw them back two and three at a time. I also love that they're baked and not fried. This is now my favorite snack when I'm in front of the tv watching college sports.